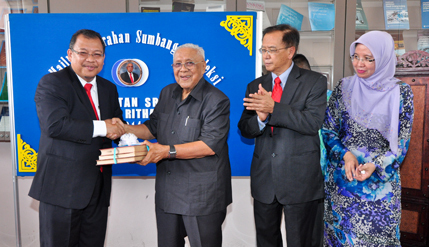 BANGI, 3 Apr 2014 – After 22 years as Pro-Chancellor of The National University of Malaysia (UKM) Tengku Tan Sri Ahmad Rithauddeen Tengku Ismail has called it a day and decided to donate his law books to the university’s Law library. Speaking at a handing-over ceremony for the priceless volumes here today, Tengku Ahmad Rithauddeen said he had thoroughly been enlightened by his tenure at UKM and was proud of what the university had achieved in a relatively short time. “For 22 years, I am the longest (Pro-Chancellor). I doubt that anyone can beat me,” he quipped, much to the amusement of those present which included Chairman of the UKM Board of Directors, Emeritus Prof Dato’ Ir Dr Mohamad Zawawi Ismail, Vice-Chancellor Prof Datuk Dr Noor Azlan Ghazali, all the four Deputy Vice-Chancellors and Law Faculty Dean Prof Aishah Bidin, among others. Tengku Ahmad Rithauddeen said he took up law because since a school boy he had heard that lawyers and legislators would be needed to govern the country when it became independent. For fifty years he had served in various capacities – in government service, in private law partnerships, an elected legislator, a minister in the cabinet and lately as head of UMNO’s disciplinary committee. Often described as ‘the gentleman politician’, Tengku Ahmad Ritahuddeen could have become a prominent trial lawyer or prosecutor or even sit on the bench if not for the nation’s second prime minister, Tun Abdul Razak Hussein, who changed the course of his life. The then deputy prime minister, who looked on him favourably, had approached him twice to convince him to join politics. The final call to serve Umno came during a case he was arguing one day in 1967 in a Kota Baru court when Datuk Abdullah Ahmad (now Tan Sri) passed a message that Razak wanted to see him. Tengku Rithauddeen recalled Tun Razak telling him that he would be appointing him Umno Kelantan chief information officer at 5pm that day and that was that. The partner of law firm of Rithauddeen and Aziz (the late Raja Aziz Addruse) tried to get out of the situation by pleading that he would have to seek his wife’s approval. “Razak told me he did not care if I wanted to get my wife’s approval but that he was going to appoint me all the same,” he says, adding that Razak “converted me from being a lawyer to a politician”. This was followed by the raucous laughter that he is known for, the master raconteur adding for the record that Tengku Nor Aini did give her approval. He reminisced about his father, Tengku Ismail Tengku Nik Haji, a planter, often sitting him down at the dining table during the Japanese Occupation and telling him that he wanted him to be a lawyer. The octogenarian, who was born in 1929 and not 1932 as stated in official records, has always been known for his impeccable English, which he describes “as a legacy from my father”. Tengku Ritghaudeen said his affinity for English and Common Law prompted him to collect books on legal cases which were housed in his law partnership office. Those books are now the property of the UKM Law Library and include 428 titles and 714 manuscripts collected over many years when Tengku Rithaudeen was in private practice and government. The volumes are dubbed the Tengku Tan Sri Ahmad Rithauddeen collection. He was later given a tour of the Law Faculty library, which had already acquired nearly 100,000 books and manucripts, both in print and in e-books form.